The Sagaris is another ridiculous car from TVR and I love it. Not all of it though because the exhaust leave me scratching my head. Why are they sticking out the sides of the rear bumper? Oh it's a TVR. That's ok then. 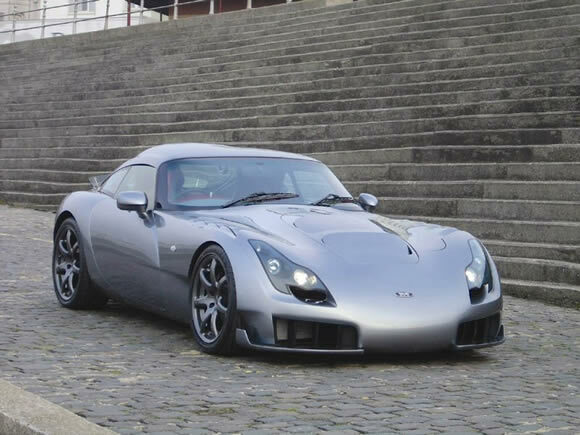 The first TVR I ever saw was a Tuscan that now been turned into a Super GT racecar. Check it out here. Amazing car. Back to the beautiful Sagaris. For the first time Clarkson says TVR have built a car that handles. They did that by hiring the guy who worked on the Noble. This means all of the 380hp from the 4.0 litre V8 goes where it's supposed to and will get you to 60mph in 3.7 seconds and onto a top speed of 160mph. Personally after watching the bonnet jump around and listen to the rattles I'm not sure I would want to push it that hard but it would get me through the back roads of Auckland very quickly. Watch the Top Gear test here.